With the Ricoh Theta V Kit with TW-1 Underwater Housing from B&H, you can capture your underwater adventures with full 360° spherical coverage. The Theta V can record 4K video or take 12MP photos that can be easily viewed and shared using your smartphone. The included housing lets you take the Theta V to 98' depths underwater, or into high-impact situations to protect against debris and dust ingress. See below for more information on the individual items included in this kit. Box Dimensions (LxWxH) 8.2 x 3.4 x 3.2"
Theta V Kit with TW-1 Underwater Housing is rated 5.0 out of 5 by 1. Rated 5 out of 5 by Rick from Excelente camera Boa qualidade de imagem inclusive subaqu?tica. What software is included with this package? How well does the stabilization work? 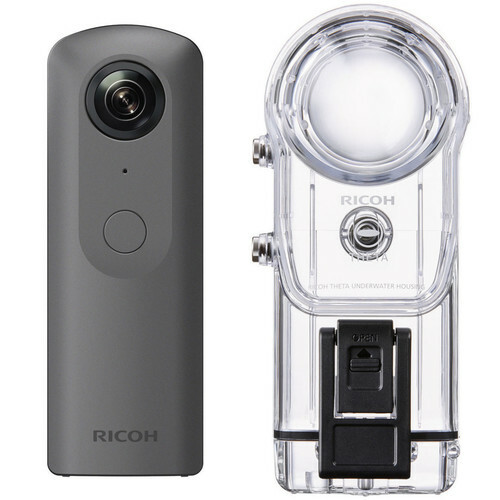 The Ricoh Theta V is equipped with Horizon Correction stabilization, meaning that regardless of the position of the Ricoh Theta V the Horizon will always be level.